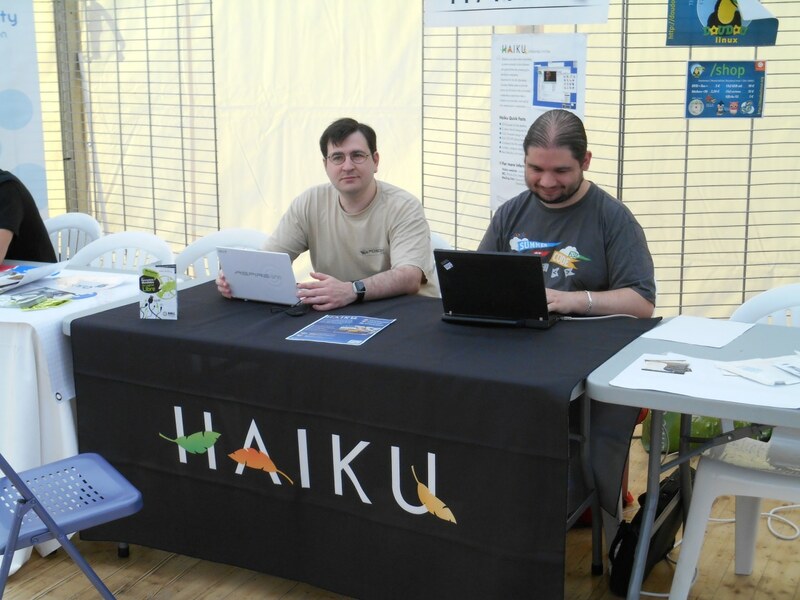 This year Haiku was all around at the Libre Software Meeting (RMLL). We had a booth for five days, a talk, and a workshop! Adrien, Olivier and I had many occasions to discuss Haiku with interested people. As for each edition, too much to see at once, lots of booths, talks and trolls. And a whole new theme for DIY as well this time. So even though finding a room to sleep in was a bit tricky, the week was as always really filled and interesting! The week-end was reserved for the public at large, with a village in the town center with many booths, including FSFE, Firefox (I trolled them about DRM), OpenPandora (an OpenHardware portable gaming console), and the local hackerspace (Le BIB). On sunday, Richard M Stallman held a speech (and an assembly of the Church of Emacs, disguised as Saint Ignucius). He discussed threats against Free Software, and why it is so important in this age of global spying. He insisted on the need to use only Free Software at school. We then had to find a place to sleep. We had 3 rooms booked but sadly it seems they overbooked some this time… Adrien arrived on saturday so he had one, but I ended up in a hotel and Olivier would have as well. The week started quite fast, with the opening plenary session, our booth to set up, Olivier arriving at noon… The libre village was located under a huge tent, surrounded by the university buildings where the talks were held. Unlike the similar setup we had in Mont-de-Marsan in 2008, the weather was a bit cloudy and windy, just enough to avoid being cooked under the tent. All the usual booths were there, several GNU/Linux distros (Ubuntu, Mageia, …), as well as Free Software advocacy groups and other non-profits like April, AFUL, FSFE, FFII, Framasoft… LUGs from here and there (including Guadeloupe), and more exotic stuff like Bépo (french dvorak-like keymap, which we already support in Haiku), ILOTH (one of the many emerging non-profit local ISPs), Liberté 0 which promotes accessibility as an integral part of the first freedom of Free Software (and trolled RMS quite a bit), and some hackerspaces for the first time, introducing people to Do-It-Yourself. Indeed this year DIY was a first for RMLL, and what a first! A whole conference theme was dedicated to it, and Mitch Altman (famous inventor of TV-B-Gone, initiator of the hackerspace movement in the US) held workshops to teach people how to solder (and really, Soldering is Easy™!). He also had many kits to sell (TV-B-Gone, Diavolino, Brain Machine, …), and gave a talk about the importance of failure. Other talks included home-made audio prosthetics, DIY in Indian schools, and even beer brewing! And with the libusb port done this year for GSoC (after several unfinished attempts by me and others) and Adrien’s recent ports it will become possible to use Haiku to tinker with DIY and OpenHardware things as well. On wednesday I had to organise a workshop to help people submit their own answers to the EU Commission’s consultation on TTIP(aka TAFTA), one more dangerous upcoming treaty that threatens freedoms online and much more. We were just a few, but it gave the opportunity to learn more about it. I also met “The Great Bortzmeyer” in person (yeah, kind of a magician, but for networks). Thursday was very busy, since I had two talks and the workshop scheduled. First, I talked about all those antique computers that can also be used with Free Software (slides), with a demo of Contiki running on an Amstrad Plus, and my ORIC Atmos showing a demo I made for VIP 2014. Then I followed on Haiku’s new packaging system (slides). After lunch I gave a workshop about packaging on Haiku (slides). Sadly for us, a talk about Org-mode was held meanwhile, so we were 3 while they were 30, you can’t compete ;-) Still, the three participants succeeded in making packages for Espeak and SuperTux. I redid and recorded the workshop so you watch at home, see part 1, part 2, part 3. Thursday evening we went to the Free Software Dinner at the shiny town hall. Next year’s RMLL was announced to be in Beauvais, Olivier’s home town, so hopefully it will be easier for accomodations. Among the many talks at the booth we had the author of Pytouhou, an XMPP client, and he has already made an Haiku package for it. This edition was really a success, hopefully it will bring us some more packagers. Let’s see if we can roll out a release before next july to have something to say next time! Most talks have been recorded. I also wrote french reports for the LOAD (with lots of photos), G3L and TripleA.